Green Street Academy special education teacher Ketia Stokes has won the Baltimore City Public Schools’ 2013 Teacher of the Year Award. Chosen by a committee of past winners and other educators, Ketia was surprised with the news yesterday during a visit to GSA by BCPS CEO Dr. Andres Alonso. At a press conference yesterday at GSA, Ketia thanked the Green Street Academy family, including current principal Crystal Harden-Lindsey and founding principal Ed Cozzolino, for creating a school environment where teachers are encouraged to innovate. “I am among the best here,” Ketia said. 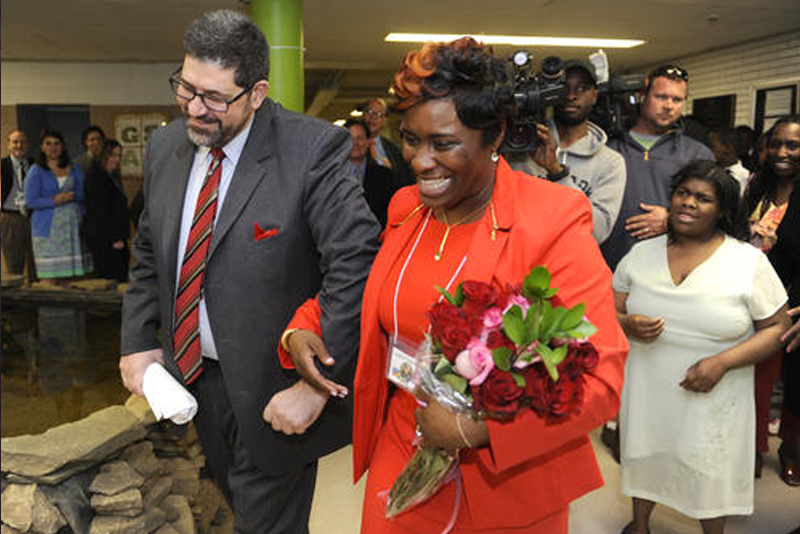 Ketia is the first special educator to win Baltimore City’s Teacher of the Year Award. In addition to appearing in the Baltimore Sun, Ketia’s story was featured on WJZ. Ketia credits her twin sister, Lekia, who is developmentally disabled, with stoking her lifelong passion for special education. Ketia has more than a decade of experience in the field. Green Street Academy was founded by David Warnock, chairman of the Warnock Family Foundation, and Lawrence Rivitz, with the mission of inspiring scholars through sustainability and project-based learning. Ketia was a founding faculty member of Green Street Academy when the school opened in 2010.